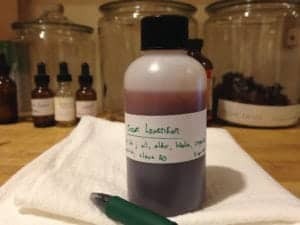 A good herbal joint liniment can make the difference between a slow, drawn-out, and incomplete healing process and one that proceeds quickly to complete recovery. 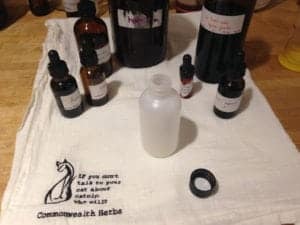 A liniment, as I use the term, means a combination of an herbal infused oil with some herbal tinctures, and usually some essential oils as well. The combination works better than just an oil blend or just a tincture blend – the tincture penetrates the skin more immediately, while the oil takes a while to seep in, so the combination gives a fast-acting but slow-release effect. The amounts shown here make 120 mL :: 4 ounces total – a good amount for a home or office first aid kit. This liniment brings together a suite of actions to heal and restore function to tendons, ligaments, and connective tissues. Solomon’s seal (Polygonatum biflorum) is a true specific for connective tissue and joints. While sol’seal’s actions go beyond sprained ankles, it is really invaluable for its capacity to restore healthy levels of tension in connective tissues and to lubricate joints. Potential alternatives include mullein root (Verbascum thapsus), an under-appreciated herb for musculoskeletal uses (though Jim McDonald has written helpfully about it), and teasel root (Dipsacus fullonum), more appropriate where tissues are torn and stagnation has developed. It’s important to include a nervous trophorestorative in the liniment, because no injury like this occurs without some nerve damage, impingement, or pain. In this batch (and in almost all cases) I use st john’s wort infused olive oil. We find st j (Hypericum perforatum) very helpful when applied externally for nerve pain (or numbness) associated with any soft tissue damage. An anodyne will be responsible for the most immediate effects of your liniment, to relieve pain. 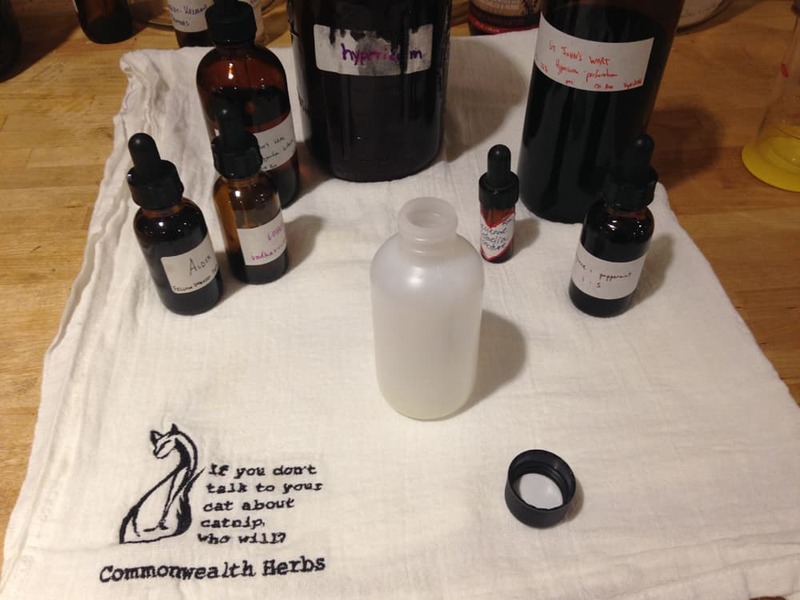 My favorite right now is alder bark tincture, and this batch we made from bark harvested on a visit to Traci Picard of Fellow Workers Farm Apothecary when she was living in New York state. I prefer alder (Alnus spp.) over other anodynes in part because in addition to relieving pain and reducing inflammation, it also has a lymph-moving effect which I believe speeds the process of wound healing. The alternatives may actually be more “standard” in this case – willow (Salix alba) and meadowsweet (Filipendula ulmaria) are two other salicylate-bearing herbs which usually fill that role in a formula like this one. I always include a rubefacient / circulatory stimulant in a soft-tissue vulnerary blend – if the blood’s not moving, the wound’s not healing! Gentle range-of-motion exercises are indispensable here, but having a little push from the herbs helps that work even better. In this particular batch, I’m actually using a 1 part cayenne : 5 parts peppermint tincture blend. This was a little experiment I mixed up, to play around with the combination of capsaicin from the cayenne (Capsicum annuum) and menthol from the peppermint (Mentha x piperita). Capsaicin chemically activates your heat-sensing nerves, while peppermint activates your cold-sensing nerves – the simultaneous activation of both is a pleasantly odd experience! There are a variety of alternative rubefacients to choose from, including ginger (Zingiber off.) – particularly fresh plant extracts – which is both easily accessed and inexpensive, as well as prickly ash (Zanthoxylum americanum), which is particularly good when there are shooting or searing nerve pains, or numbness. A strong relaxant is very helpful to relax compensatory tension that often develops around an injury site. I like tincture of lobelia (Lobelia inflata) here – which works very rapidly to release tension in the musculature. Using cayenne & lobelia together as catalyst pair in all kinds of formulas, both internal and external, is a trick I learned from listening to Paul Bergner. He taught it as a habit of the Physiomedicalists of the late 1800s, who used it to simultaneously stimulate vital force & remove obstructing tensions. Several years ago, a student in our Apprenticeship Program took this idea to heart and made a combination tincture, sharing small vials with us and all her classmates during our graduation medicine show. I’ve frequently found it useful, and had just a drop of it left for today – medicines made with personal input and care are always best! Aside from lobelia, alternatives here include crampbark (Viburnum opulus), a reliable general-purpose relaxant, and fresh preparations of kava (Piper methysticum), with its peppery carminative quality and pain-numbing effects. If you used either of these, though, you’d need them to be at least 10% of the formula for their effects to be noticeable – they’re not quite as potent as lobelia. Finally, a penetrant helps to drive the herbal constituents and their activities deeper into the tissue. Essential oils accomplish this well – today I used essential oil of clove (Syzygium aromaticum), though wintergreen (Gaultheria procumbens) and peppermint (Mentha x piperita) are also efficacious for this purpose. As to storage, I like to keep this in a non-reactive HDPE or Nalgene bottle, because I’m often packing this into a first aid kit and these plastics are lighter than glass, and entirely shatter-resistant. If you’re only going to use it at home, you can keep this liniment in a tincture bottle with a dropper for ease of application – just be aware that the rubber in the dropper top will degrade after long exposure to the oil, so you’ll want to keep a flat cap on most of the time (especially while shaking), and just use the dropper during applications. Did I mention the shaking? SHAKE WELL BEFORE USE. You need the oils (infused and essential both) to disperse evenly throughout the liquid before application. If you just let it sit, they’ll separate. Apply liberally 3-5 times per day. More frequent applications will be more effective! If used only twice a day or less, you may see only minimal improvements. Rub it in like you mean it. Take some time. Work out those adhesions and fluid stagnations. Get everything good and warm and moving again. This doesn’t mean you have to push hard! Be gentle, especially with new injuries. This liniment should be used as part of a broader protocol including gentle range-of-movement exercises and stretches, rest, warmth, good nourishment, and lots of sleep. OK, there you go! This is one of our most reliable and trusty remedies. I hope it helps you as much as it has helped me. Now get out there and play! Do you recommend applying this to regular aches and pains that aren’t specifically related to an acute injury?